"The Knobs" is the physiographic region that borders the Outer Bluegrass. It consists of hundreds of isolated, steep sloping, often cone-shaped hills (see photo above). In physiographic terms, the hills are monadnocks or erosional remnants. They were originally continuous with the Mississippian Plateau, but were separated from the plateau by stream erosion. Many of the knobs are still capped by erosionally-resistant limestones or sandstones (see cross section A-A' below). The sharp slopes of the Knobs are mostly composed of shales of the Mississippian-age Borden Formation, which are less resistant to erosion than the overlying limestones and sandstones. The base of the Knobs commonly contain Devonian black shales (see cross section A-A' below). The Knobs physiographic region occurs along the outcrop belt of the Devonian-Mississippian contact. The knobs are usually associated with the outcrop belt of Silurian and Devonian rocks which commonly crop out nearby. Bernheim Forest (south of Louisville) and Berea, Kentucky are located in the Knobs Region. Click on the line A-A' to see a cross section through this knob. This is a geologic map of the same area shown in the photograph above. The different colors represent different units of strata mapped on the ground. 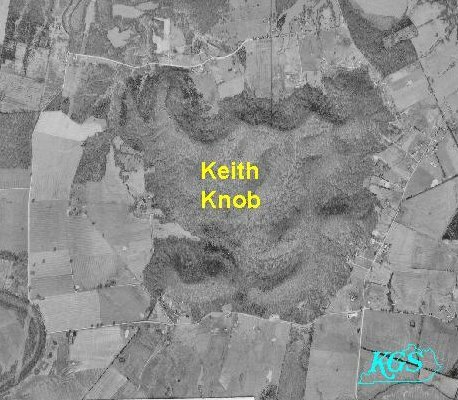 Keith Knob is underlain by thick Devonian- and Mississippian-age shales (see cross section above). These shales weather and erode to form steep-sided hills. The crest of the knob, is formed from a cap of limestone. 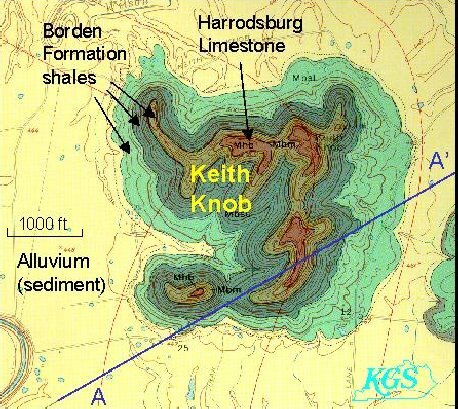 The knob is surrounded by farms, which are developed on sediment called alluvium. The alluvium was deposited in floods from the river. The map and cross section were modified from Peterson, W.L., 1967, Geoloigc map of the Lebanon Junction Quadrangle, central Kentucky: U.S. Geological Survey, GQ-603.